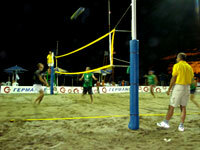 Since 2005 the Community and the Friends of Matala, with the support of the Mayor of Tympaki, have organized a highly popular and successful beach volley tournament. The teams taking part are local boys and girls, as well as visitors and guests of Matala. The tournament takes place at the beach of Matala and there are prizes for the first 3 teams. At the end of the tournament there is a big party with live music at the parking place on the beach. The entrance is free. 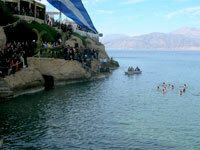 In Matala as well on this special holiday, the waters are blessed with the throwing of a cross . This is done to celebrate the christening of Christ when, for the first time in religious history, the Father, the Son and the Holy Spirit appeared simultaneously. Τhe word Theofania which literally means the appearance of God. The cross is thrown three times into the clears waters of Matala beach and as tradition goes, any willing participant, jumps into the waters to find the cross.